6 years ago Simon Zutshi asked me to work with him to create and grow the online media presence of property investors network ‘pin’. He’d seen me online and knew I was active within various online communities, as well as hosting my own events – in Property, Business and Internet Marketing. I’d been doing online marketing for a long time and active on Facebook using paid Advertising (since 2008) before a lot of the big corporates were even aware of online marketing. I’d also helped at and supported many personal development events, from local YES Groups to bigger Tony Robbins UPW events and similar. As well as booking speakers for events, it was important for me to provide outstanding customer service to attendees as well, as I’d been to too many events where the organisers lacked integrity and each person was just a ‘lead’. Things sometimes do go wrong and we all make mistakes – but when no-one takes actual responsibility for actions, service suffers and so does ‘word of mouth’ (and now social media posts) about your company. People are the most important part of any community or business. Working with pin was a good fit, as one of my biggest values is that people should have a good time and feel valued. I would be able to help create that community online. When I started with ‘pin’, I took on the task of creating and building the online presence of the property investors network across various online platforms and company websites. This grew from a few meetings to 50+ meetings and I was responsible for maintaining their online presence. Once I’d systemised all this, it became easier to scale and grow the online exposure. The online marketing was all bootstrapped but has grown to a successful and large presence, had I bigger budget to work with I’d have done an even better job. I also provided training & support to pin meeting Hosts on how to best use social media effectively, to connect with people and increase exposure for the meetings they ran in their local areas. Another task I took on was to keep on eye on the online reputation of Simon Zutshi, the company and the meetings. As well as the online social media presence, I supported the Mastermind community by making sure information was easy to find on the forum and help them out with any queries they had, whether it was my ‘department’ or not. Either I’d sort it out myself or find the best person to help them. All your clients (and team) are important, especially those that have paid for first class support. This belief is what enabled me to provide the best service I could whilst at pin for many years. In my spare time (Entrepreneurs don’t take evenings or weekends off, unless they want to take a holiday) I would also support on other events and help other Property education providers, as long as there was no conflict of interest. After being there for over 5 years, it was time to move on. So I have now moved to Milton Keynes. Why you ask? Why not? It is closer and easily accessible to all the places I usually visit, from Birmingham & London being within 1 hour or so drive. It was also good for a fresh start and to work on some new projects. I’m now looking for a new challenge. Are you in property, personal development or a business related field and want to improve your service and/or reach? Or maybe you just want to create a community to share your love or hobby? Even if your idea is to start a Nicolas Cage Appreciation Society, get in touch. If you have a business and no time to do it yourself, then why not give me a call and see how I can help. My past experience and long-term view will help save you and your team many hours and tens of thousands by setting up things right to start with. As I did when I advised a new property education startup earlier this month on the best way to set up and move forward. The digital landscape has changed a lot in the last few years again, so don’t think that trying to copy someone else will help you remain ahead anymore. It’s not just what you see at the front end that counts but how it is managed in the background that matters. Solutions focused Systems & Operations Freelancer looking to contribute extensive experience towards supporting progressive organisations in optimising their performance. Through increased efficiency by systemising, making things simpler by automating frequent processes, serving clients and having happier customers by meeting their needs and over-delivering on expectations. My background is in Engineering, Property, Systems, Networking and Training Events and Social Media/Digital Marketing. Engineering has given me an analytical background and project management skills which come in useful with jobs that require attention to detail and planning. I have been involved in property investment and education since 2001, learning valuable lessons through boom and bust, and know many of the experts and trainers in the UK. Attended a lot of personal development, business and entrepreneur seminars and paid for high-end coaching over the last 10 years. As well as attending these events, I’ve also set-up, organised and hosted networking events, as well as helping out and crewing for many training courses. Extensive background in social media and online marketing, website design from SEO to funnel creation, including paid marketing and CRM. I’m more than competent in a lot of fields, although not a self-proclaimed expert or goo-roo. I realise I can always learn more and be better at everything. I’m a polymath (Renaissance man) with curiosity and many hobbies, talents and areas of interest and expertise, therefore I have a wide knowledge base that I can draw on and use in other areas to solve problems and for success. I can explain what needs to be done in simple language, by removing fluff that some experts use to complicate things to justify their position. I will listen to your ideas and recommend creative solutions & improvements. I offer highly professional consulting and honest opinions and feedback, always acting in the client’s best interest. So if any of that is of interest, contact me today on Facebook , Twitter and LinkedIn or call if you’ve got my number and not rung me for a long time anyway. Always happy to meet up and have a chat. know about these events and share them with your friends. Joseph McClendon, Simon Zutshi, Andy Phillips and Sohail Khan. When it comes to Business on the Internet, Andy is the Man! world with Tony Robbins on the ‘Unleash the Power Within’ seminars. Want to find out what is happening to the economy? I hope to catch up with you before Christmas. Hosted by Steven Aspinall, Bobby Gill and Mike Clarke PLUS 10 TOP UK Experts, this 2 day event has been setup for entrepreneurs based “Up North”. 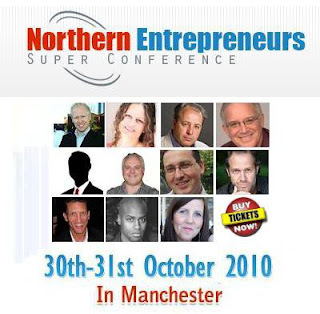 With high profile members and guest speakers, the Northern Entrepreneurs Super Conference is all about connecting with the right people. Creating connections with key players in the industry. It’s about making yourself known in the marketplace as the best person to do business with. The aim as is to help you make the right contacts in the marketplace. The event offers the most cost effective method of meeting the industry’s decision makers. There has never been a group of leaders like this assembled at the same event! Really. Your future is important and we encourage you to attend this event. But it still only offers one perspective. At The Northern Entrepreneurs Superconference, you will hear the insights, case studies, and best practices of many of the Industry leaders. It doesn’t matter if you are into property, internet marketing, or Investing, we have put together what is arguably the strongest faculty of leadership talent that has ever been assembled under one roof! You will hear how Average people have gone from zero to building a multi million pound property, how properties can be purchased without a mortgage, numerous ways to increase your cashflow, proven techniques to generate online traffic, and many more………..
With a little discernment and critical thinking, you can study all the options and leave Sunday night with the strategies that will work best for YOU. • Develop passive residual income! They were selected because of their unique gifts for taking what they have learned, and teaching it in a way that you will hear it, understand it, and then be able to go back home and immediately implement it! All of these key people have powerful information you need to know about. We believe there is a shortage of similar events for people that live in the North. We want to show that people that live up North have got as big aspirations as the guys that live in the south. Wouldn’t it be wonderful to get the money thing out of the way, and lead the lifestyle you dreamed about? You can. But more importantly, you will leave Sunday evening with a toolbox of techniques, strategies, and skills you can immediately put into practice to build a life beyond your wildest dreams !!! If you are serious about building a massive, exponentially growing business – clear your calendar right now, and get yourself a ticket for this event !! We’re not bringing in the most successful people in the profession to teach you how to make a couple hundred pounds, we want you to walk away with a clear strategy on how best to create wealth !! Any one of these speakers could do the entire weekend, and you’d still get the bargain of your career. Put them all together in one room as we are, and you have the largest and strongest collection of speakers ever assembled under one roof! We’re talking about people who have founded huge property business’, developed legions of leaders, built networks in the thousands, conducted hundreds of opportunity presentations all around the world, discovered how to overcome fear and rejection, uncovered the secrets of the most compelling presentations, and made millions of pounds in their chosen career’s ! This is not an event for the idle curious. It is for people who want to turn their business’ into a multi-million-pound, income money machine! We don’t tell you that to impress you about how “big” they are. But to demonstrate how lucrative and valuable a weekend with people like this can be for you. We’ve assembled the finest minds and put them at your disposal for an entire weekend. • Ask them questions one-on-one! Fortunately, we can keep the price below market. So the event is only £67. And if you act before 10pm on Sunday 17th October 2010, you can sneak in with our 30% OFF Early Bird Special of only £47! Seats are limited, so BOOK NOW as this event will sell out !!! UK Banks causing a double dip? The Banks were technically bankrupt a couple of years ago but got bailed out by us. Now they want as much cash in as possible, despite the cost to businesses and the economy. Unfortunately the Banks are not run by people but systems and organic robots – they are only interested in their bottom line and do not care about the economy, taxpayers, you or me. The dip is coming, not good news for people with equity to lose or poor cash flow – but an opportunity for investors to stock up on houses! See Simon Zutshi’s article below and join his Mastermind Programme to stay ahead of the pack. Simon Zutshi is giving away a full scholarship on his next Property Mastermind Programme starting in October 2010. This is an incredible 12 month Programme that will teach you how to be a professional investor with the objective of buying £1m in property and giving your £50k in the bank in 12 months. Note: This offer is for Serious UK investors Only! Are the UK Banks causing a second dip? “There is a lot of talk in the media at the moment of the possibility of a second dip in the UK housing market. There is a good chance that there could be a second dip particularly when the banks release all of the repossessed property that they are currently holding, into the market. When the supply increases then house prices could fall further, if the demand is not sufficient to soak up the extra supply. However, I would argue that the demand is there. The two groups who stimulate the market are investors and first time buyers. Investors realise that properties stack up well at the moment, far better than they have for a few years. If you are investing for the long term it does not matter if prices fall in the short term, as long as you can afford to hold by ensuring you buy in an area with strong rental demand and positive cash flow each month after all the expenses. First time buyers are also keen to get on the ladder before prices go up although many of them are uncertain about what the future holds due to all the scare mongering in the press. The main problem lies with the UK banks and their lending policy. Understandably they have learnt their lesson and I am sure will now lend more responsibly than in the past, which has got to be a good thing. However, for the UK market to recover the lending availability has to improve. The banks are already being cautious by restricting their lending on Buy to Lets to 75% Loan to Value so they have plenty of buffer in case prices fall. They are also being careful of whom they lend to although I would question the logic behind some of their decisions. The Lloyds TSB banking group now owned by the government (or rather the tax payer) restrict the number of mortgage across its brands to a maximum of nine. Most experienced investors, with a reasonable sized portfolio, would exceed this limit and so would not be able to get further mortgages for any lender in the group including; Birmingham Midshires, Halifax, Lloyds and C&G. Ironically these banks seem to be happy to lend to a complete novice investor, with absolutely no experience and so someone far more likely to make mistakes than an experienced investor to whom they will not lend. It does not really make sense. But the real problem is that the banks are instructing surveyors to down value properties in their surveys. Most surveyors would say that a property is worth what someone is prepared to pay for it. However, this wide spread policy of down valuing property ignores the fact that there are buyers prepared to pay the agreed price. When the property is down valued the mortgage offer is adjusted down and often not sufficient enough for the buyer to afford the property, so the sale falls through. The surveyors are under pressure from the banks and they don’t want to be sued for getting it wrong. Willing buyers are not able to make the purchase they want and so the market stagnates as people get stuck in chains and the net effect is less sales. Less sales will lead to a fall in prices and a general down valuing of the market. Thus the second dip that the press seem determined to talk us into. This is bad news for everyone, including the banks who will have even less security and equity on their existing lending. With many people potentially in negative equity unable to afford to move, the market will stagnate further and take even longer to recover. Again bad news for everyone. If we are not careful we will get to the point where no one can sell or buy and the only solution will be to do every property transaction as an option. I am convinced purchase lease options will become far more common place over the next few years. What we need is some positivity in the press to encourage first time buyers to stimulate the market and general easing of lending criteria so that more people can access the funds to buy the property they want to purchase. And ideally an end to this policy of Banks telling surveyors to down value property. I’m aware of this case that Simon Zutshi has just written about on his blog. It’s a tough one with so many parties involved but you’re right, a lawyer should be looking after the best interests of the client at the time and not providing financial advice. Unfortunately I know of another lawyers / solicitor / legal ‘advisor’ who seems to think that whatever the money men (banks) say is the truth without actually really being able to apply the legal rules in specific circumstances. They tend to open the text book at a certain page and say that’s how it is or discuss things that they have no idea or experience about. There’s nothing worse than bad legal advice from someone who doesn’t have any attachment to the outcome. Definitely worth bringing up with the law society as someone has to hold them accountable! Also the other family members are partly responsible too, allowing greed to get in the way of sound judgment. Did they consider the implications of what would happen if they couldn’t sell it for a higher price? What happened to common sense? Clearly it doesn’t pay the bills. I still can’t believe it. I have been dealing with a motivated seller in London who is being repossessed on the advice of a lawyer acting for one of the family members and even worse this decision has been backed up by a Judge. I was speaking at an event in London last week and at the end I was approached by a gentleman who for privacy we shall call Mark. Mark asked me if I could help because his mother’s property was due to be repossessed this week! He asked me to come and look at the property to see if I could help them. It is a large four bed property in North London in need of some work but a fantastic location. Mark explained that his mother lives in the property but that he, his sister and his mother were all on the mortgage. So the house was put on the market and as a sale had been agreed the lawyer representing Mark’s sister (let’s call them “Bungle & Scarper”) had suggested that the family members stop paying the mortgage and the arrears that build up could be paid off when the revenue comes in from the sale. This is a risky strategy in the event that the sale could fall through, which surprise, surprise it did. We all know what happens if you do not pay your mortgage (or maybe we don’t all know) …eventually you will get repossessed. Mark had already been to court with his mother and the Judge advised that the property had to be sold. Mark was a very motivated seller. He and his mother agreed that they would rather sell the house at a discount, to clear all the debt and walk out with £100k rather than get repossessed, have their credit records trashed and potentially not get much money after all the associated legal costs. Mark had an investor lined up ready to buy the property who also went to court with them to present the solution. Unfortunately, Mark’s sister and the other brother and sister had a different view. On the advice of their lawyers, Bungle & Scarper, they thought the best solution would be good to get repossessed and then do a deal with the lenders solicitors to sell the property on the open market get the best possible price and then hopefully they would get more money from the sale, not to mention the trashed credit rating or maybe they are unaware of the full implications. Incredibly the judge thought that the investors offer was too low (even though it would clear all the debt and give the family £100k plus), and agreed to give possession to the lenders solicitors. How can being reposed be the best solution for the property owners? Maybe the judge was thinking that they will get more money by selling the property on the open market. Well, whilst I agree they may receive a higher offer I wonder if the Judge has conserved all the associated costs. For a start an estate agent in London would want 2.5% of the sales price. I am sure the lenders lawyers and Bungle & Scarper will also have very high costs associated with their time involved in the sale, not to mention all the interest and penalties building up whilst the property is marketed and sold. This cannot be right! Maybe I have a simplistic view of this. Maybe I have had a bias account of the facts from Mark but this does not seem right to me. Is this fair? What do you think? I wonder if Bungle & Scarper were more concerned about the fees they can earn from the prolonged case rather than the best interests of their clients. It looks to me as if this lawyer has been giving financial advice to their clients. Interesting as I don’t think they can do that. I wonder what the law society would have to say about this? 2. You need to be aware the advice that sellers are given may not be the best course of action for them. 3. When you are dealing with sellers always put their interests first ahead of your own and try to come up with an ethical win win solution. 4. When there is a disagreement between family members the judge can decide the course of action he sees fit. Feel free to post what you think about this case study.